The relationship between brain mass and body mass in strepsirrhine (n=15) and haplorhine species (n = 21) demonstrates that strepsirrhines have relatively smaller brains than haplorhine species (Figure 2). The scaling coefficient for strepsirrhine species is significantly lower than that of the haplorhines (0.75 versus 0.64; P<0.05). 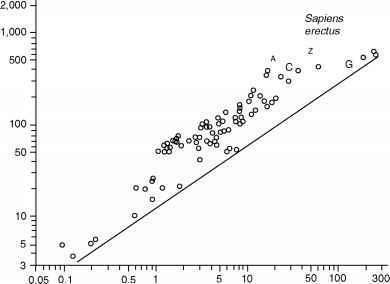 Additionally, the y-intercept of strepsirrhines is significantly lower than haplorhines (P < 0.001). The relative size difference in brain mass of strepsirrhines and haplorhines is also evident from the z-scores of the brain mass to body mass regression for the pooled sample. Mean z-scores are significantly lower in strepsirrhines than haplorhines (P <0.001). 4 One of these species, Eulemur fulvus, is more appropriately classified as "cathemeral," which reflects its activity period both during the day and night (Fleagle, 1999); it has been collapsed into the category "diurnal" to allow statistical treatment. Figure 2. 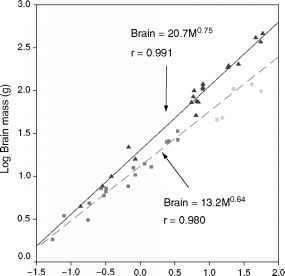 Log10 plot of brain mass (kg) versus body mass (kg) for strepsirrhine species (n =15) and haplorhine species (n = 21; humans excluded). The scaling coefficient for strepsirrhine species is significantly lower than that of the haplorhines (0.75 versus 0.64; P < 0.05). Asterisks represent values for subfossil Malagasy lemurs based on reconstructions (Table 4). not significantly differ from haplorhines in mean z-scores of the brain mass to RMR regression for the pooled sample.